When I first saw the title for this book, I thought it was really clever, from an internet search point of view. It’s very close to Arthur Edward Waite’s The Key to the Tarot, later to become the Pictorial Key to the Tarot. The similarity ends there though. While Waite’s book is written in his famously meandering and spiritually elitist style, Sarah Bartlett’s book is clear, concise and above all, readable. It’s easy to understand and will be accessible to all levels of readers, though this book really is aimed at the beginner. Coming in at 192 pages, and measuring 18 cm x 24 cm, The Key to Tarot is larger than the Tarot Bible. Like the Visconti-Sforza: The Golden Tarot and the Tarot de Marseille: The Tarot de Madenie, the book is published by Quarto Knows – and they sure know how to present written content well. It’s full colour throughout and uses Lo Scarabeo’s Universal Tarot for card images. Chapter 1 looks at tarot history, choosing a deck, taking care of it, shuffling, drawing cards and introduces Bartlett’s infamous ‘card positions’ from the Tarot Bible. This looks to be taken from the small cross of the Celtic Cross Spread. The positions are: you now, blockages and the future. This is important because like Tarot as Your Companion by Hajo Banzhaf and Elisa Hemmerlein, Bartlett incorporates these positions into her tarot card meanings, which I just love. In a few words she manages to show the reader how the card applies in those positions and how they can appear to be modified by the positions also. It’s a really smart way to help the new or struggling tarot student to see how flexible tarot is and how to apply it in different ways. Chapter 2 is self explanatory and so I shall go straight into how Bartlett deals with tarot card meanings. After an introduction we reach the Astrological Affinities and Numbers section. There is a small explanation of this and a chart that shows each major arcana card with its card number and keyword, and astrological affinity, again with a keyword. For instance, the Fool is Arcanum Number 0 – Unlimited Potential, and its Astrological Affinity is Uranus – Freedom. Affinities is just a nice way to say correspondences. These are the only ones presented and is one of the good things about this as a beginner’s tarot book – it’s clean and focused on the essentials. 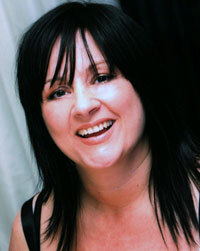 Where another place The Key to Tarot differs from the Tarot Bible is in each card’s entry. While some of the original keywords and descriptions have made it through to this new edition, we now have a full page dedicated to an exercise or ritual/spell peculiar to the card. Remaining with the Fool, we are asked to imagine our own bag (from the imagery of the Fool), draw it on a piece of paper, and fill it with five things that are important to us while listing those five things beneath our drawing. Bartlett says they can be any five things, objects, concepts, ideas – anything that is important to you that you wouldn’t want to be without. Thinking of a destination, we are taking these five things with us on our journey. We are then asked to fold the paper and put it in a hiding or secret place with a clear quartz on top to ‘charge it with illuminating energy’ – the intention being to bring us closer to the Universe. Neat. Each major arcana card has its own exercise or ritual to help you connect better with it and I like this idea very much. Rather than a passive guided meditation, this is interactive and will help you connect in a deeper way with your tarot cards. Chapter 3 contains what you would expect – tarot card meanings for the cards in each suit. It begins with an introduction to the suits, their elements and their qualities and then introduces a brief but very effective method of applying the qualities of the numbers to the suits. Like the exercises for the Major Arcana, this exercise will help you to understand each minor arcana card in a way that you can make sense of. Again this is interactive and a lot of fun too – I had a great time with this exercise! The introduction also has explains the court cards in a general sense and again includes an exercise for getting to know this group better. Following on from the introduction, the court cards are the first ones we meet in each suit. Again, there is an exercise to get to know the royal family in their suits rather than just generally. We next meet the pip cards which are presented in two groups of five, Ace through to five on one double page with their meanings, which also include the ‘card position’ method as well as a general exercise incorporating the five cards presented. This is repeated on the next double page for cards six through to ten. Once you reach the end of the minor arcana, there is a closing exercise for this group of cards which incorporates the elements, which I love, naturally. Chapter 4 is where you most likely look to first but of course has to be the final chapter and last thing you learn about in this book – and it doesn’t disappoint. Bartlett presents no less than 21 tarot spreads as well as an introduction to reading tarot and how to interpret a tarot spread, with a deeper analysis of the ‘card positions’ – now a full spread in its own right. Helping the beginner is Bartlett’s speiciality and she includes six really useful three card spreads to help you on your way. The tarot spreads that follow do grow in spread positions but as ever, she walks you through them effortlessly and provides sample readings so you can see the spread in action. Like the ‘card positions’, a useful five card spread called Priorities looks to be lifted from the Celtic Cross Spread. It utilises the small cross bar the past position. This is actually a really useful spread and clever way to modify any large spread you may already work with. The first two positions will be familiar to you if you use the Celtic Cross: 1. My priorities right now and 2. What is blocking me. The names of the positions change from there to 3. The things I need to change, 4. Helpful outside influences and 5. The outcome. Staying with the Celtic Cross for the time being, it has been give a makeover, in one of its positions, and some of the names. I haven’t tried it but it’s easy to see it will work well. Other notable spreads include: My Secrets; Who Am I? Goals and Objectives and the Mystic Seven – another spread that is derived from the Celtic Cross Spread. There are others and it’s formula that Bartlett seems to like but hey, they work and that’s all that counts. I really like The Key to Tarot, which you can probably tell by the length of this review and the praise I heap upon it. There is nothing deep here and some of the work is recycled from the Tarot Bible. However, tarot is timeless and when you’ve written something really well, why do you need to change it for a new audience? Between Bartlett and the publisher, Fair Winds Press, they’ve done a really good job in presenting a pleasing, engaging and useful book in a beautiful and accessible way. 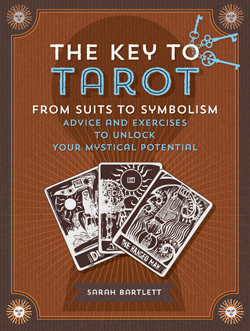 I highly recommend The Key to Tarot and would say to beginners or struggling tarot students, why splash out hundreds of dollars on a tarot course when you can buy this book for a lot less and get so much more out of it?